What’s with this weather? Oh my… we had a huge storm last night. 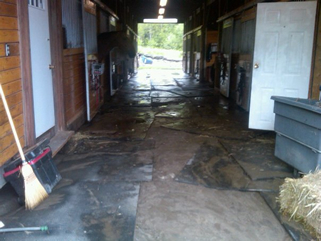 The barn was flooded with water and our road got washed away. It was a loud and scary storm! Thankfully no one here was hurt. After the storm I watched my two-legged friends examine the damage, and was struck by how well they were dealing with the emergency. Rather than getting upset or lamenting the losses, they moved forward and made a plan. They called for a tractor, ordered some gravel to fill in the washout in the road, and got out the shovels. I heard them say that this same storm system had spawned killer tornadoes all across the country, so this was nothing in comparison. While they were cleaning up the mess they talked about how grateful they were to be spared that kind of damage. They even stopped at one point and offered silent prayers and positive energy to those who were hurt or killed, and those who lost their homes. Life is hazardous. There’s just no denying it. Bad things happen. Sometimes loved ones are taken from us way too early. Sometimes property is lost or destroyed. That just the way it is. Loss needs to be felt. Grief must be acknowledged and fully experienced. Denying it just postpones it. But your experience of your life after the event is a choice. You can fall apart and lament the disasters, or you can pull yourself up and do what you can to make the best of what’s laid out before you. You can stay stuck in the grief or become chronically angry, or you can look at things from another angle and be grateful for the good that is left. The choice is yours. I’m very appreciative of the people I have around me. They are positive thinkers who move beyond the negative events as quickly as humanly possible. They acknowledge their upset feelings and then look for the proverbial silver lining. This takes work and focused determination, but they do it every time, no matter how bad things look at first. It is said, life is 20 percent what happens and 80 percent how you react to it. How do you react to the upsets in life? What is your 80 percent like? Are you willing to take responsibility for your experience, or do you prefer to be a victim? Do you intentionally look for the upside, or are you more comfortable staying in the pain? Today, I’m going to appreciate the green grass, the beautiful clear blue sky, and the friendly fellow who is patching up the road. I still have a barn, a shed full of hay, and friends to keep me company. What do you have to be grateful for today?